Find Better Ideas, Faster ® with a custom merchandise trend report, our PRO Dashboard and 80+ categories of premium trend reports. 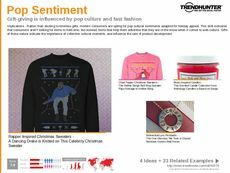 The Merchandise Trend Report features an expansive list of the newest trending offerings making a considerable impact amongst consumers. Using our exhaustive and through research methods, we're able to identify the leading market patterns across multiple demographic groups. We also provide our expert commentary on future predictions for a complete rundown of the hottest merchandise releases. Professionals in merchandise design, production, marketing and retail will be provided with excellent observations throughout this report. Use this data to help spark innovation amongst your team by fostering a climate of creativity and ingenuity backed by proven market findings. The Merchandise Trend Report's informed findings are a key component in helping to ensure a successful merchandising strategy and execution.